Western blot analysis of extracts from various cell lines using 14-3-3 (pan) Antibody. 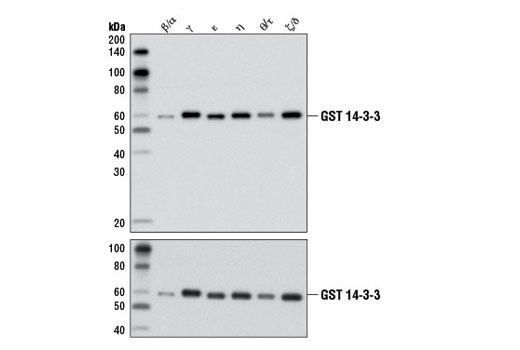 Western blot analysis of purified, recombinant, GST-tagged 14-3-3 isoforms using 14-3-3 (pan) Antibody (upper) or GST (91G1) Rabbit mAb #2635, (lower) demonstrating isoform cross-reactivity. 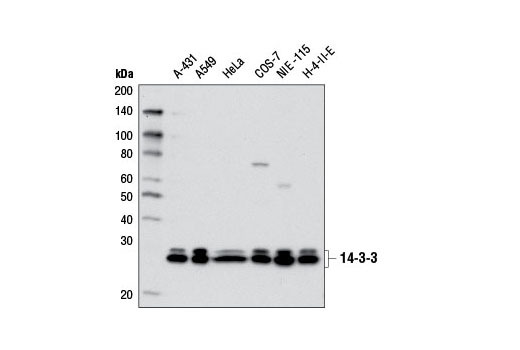 14-3-3 (pan) Antibody recognizes endogenous levels of total 14-3-3 protein. This antibody detects all known isoforms of mammalian 14-3-3 proteins (β/α, γ, ε, η, ζ/δ, θ/τ and σ) and is predicted to detect 14-3-3 homologs in other species. Polyclonal antibodies are produced by immunizing animals with a synthetic peptide corresponding to residues surrounding Met223 of human 14-3-3γ protein. Antibodies are purified by protein A and peptide affinity chromatography.